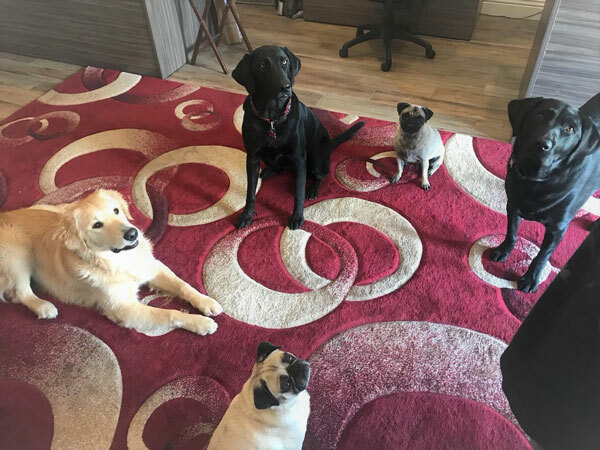 Whether you have some simple San Diego blinds and shutters that tie your apartment living room together, or have purchased some unique window coverings that are particularly high in quality, you want to be sure they aren’t under threat of damage from your pets. In this post, we’ll be going over some simple tricks and techniques to keep your furry friends from destroying your window coverings. It’s no secret that cats like using their claws, and one thing they love to do is climb on our furniture with them. Few things of ours are as enticing to a cat as low hanging drapes. Unfortunately, there’s simply no way to prevent them from doing this (at least while you’re not home) while still retaining the aesthetic appeal of your drapes. You probably aren’t too thrilled about the idea of wrapping your drapes in plastic, after all. The best thing you can do is to replace your drapes with something else. In San Diego, shutters and blinds are a fantastic idea given our hot climate. These window coverings are far less tempting for your cat, and also involve more cat-proofing options. 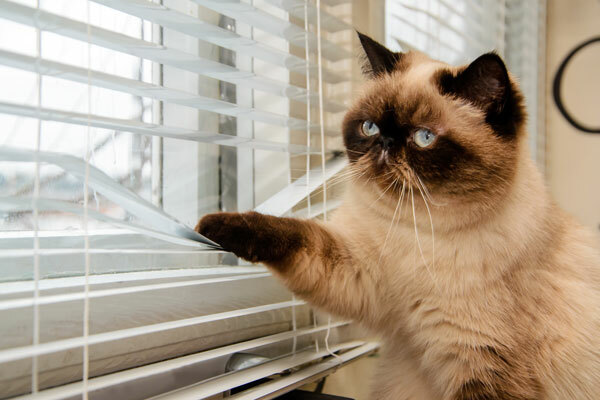 Cats love jumping up on windowsills to get some sunlight or observe what’s going on outside. While there, they often become mentally stimulated and take that energy out on surrounding objects, and that means whatever window coverings they had to jump through. Plastic blinds often have misaligned or bent areas and for some reason, cats go right for them. You can always tell when someone owns a cat or two if you go into their house and find plastic blinds with missing outer areas. Of course, there’s always the particularly spastic cat that ends up tangled in them, at which point it’s probably better to just replace them altogether. Wooden San Diego blinds and shutters are a fantastic alternative to plastic blinds if you own a cat or three. First of all, wooden blinds and shutters can usually take a good deal of feline attention. Also, wooden shutters often attach to the window frame, thus reducing your cat’s access to the windowsill in the first place. Best they aren’t even tempted! Vertical San Diego shutters are also a great idea, as they are not only safer from cat-related damage, but allow your cat easy access to the window sill without doing them any harm. Keep cords away from your cats. Long cords on window coverings are a lot of fun for your cats, and can often lead them higher up towards the window coverings themselves. Be sure to wrap up your cords and keep them as high up on the window treatments as possible (this also reduces the risk of cats accidentally choking themselves on them). Use carpet strips, tinfoil, or double-sided tape on your windowsill. Your cat will likely not enjoy the feeling of these materials and will thus stay off them. Set a specific window aside for your cat. If you have a window in your house that doesn’t require any window coverings, close all other window covering so your cat is naturally drawn to this one. Apply citrus spray. Cats are known to dislike the smell of citrus. Purchase cordless blinds and shutters. These are far less tempting to your cats. Purchase shades. In San Diego, shades are a great option, especially for people with cats. 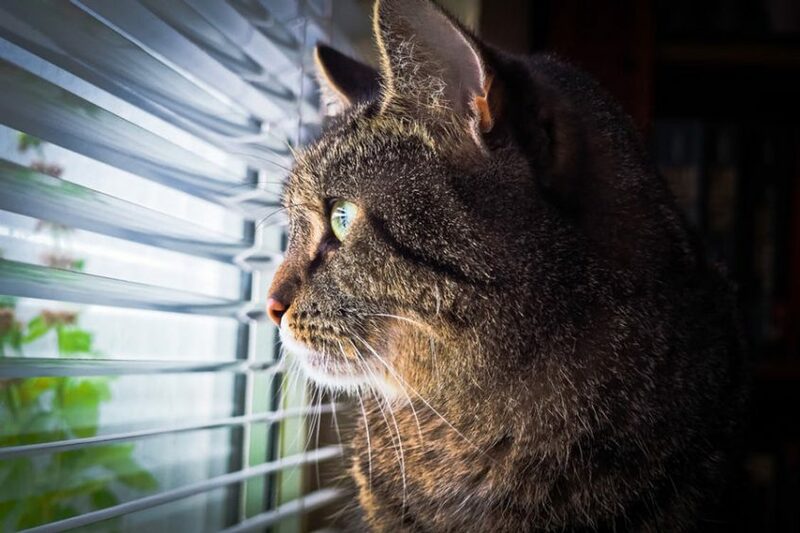 Besides vertical blinds and shutters, roller shades are simply less tempting to your cats than any other window coverings. Bonus: they don’t easily collect cat hair. When dogs destroy window coverings, it’s usually because they see them as an obstacle to what’s going on outside. Dog owners know, it’s basically impossible to train your dog not to react to sounds outside, especially loud cars, other dogs, and sirens. Some dogs are more determined to see what’s going on outside than others, and thus bend, break, or chew through them. However, there are also those dogs who, like cats, see window coverings as chew toys. Finally, there are dogs that panic while you’re away, and thus dismantle everything – including the blinds. Here are some window treatments that can help with all of these behaviors. 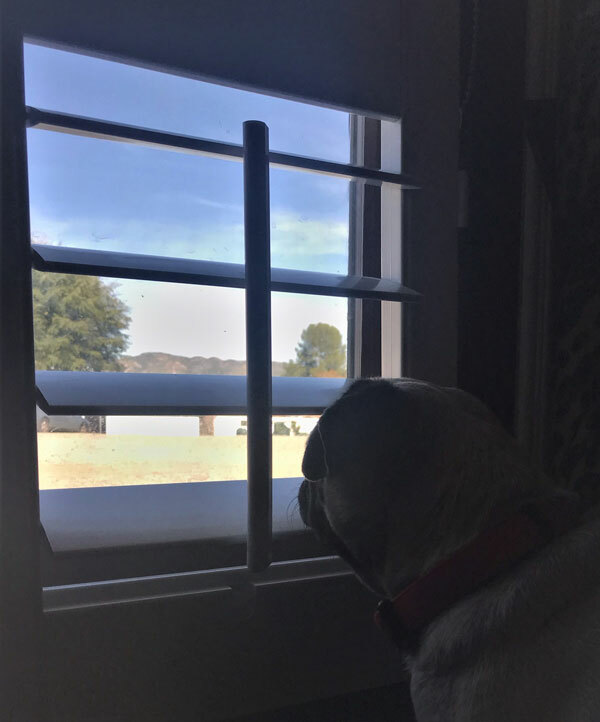 In San Diego, blinds in the vertical style are purchased by many people because they aren’t only a stylish option for the San Diego area, they are also less easy for their dogs to destroy. A dog that paws at blinds bends and breaks them, but if they’re vertical, there’s no chance of this happening. Not only that, but dogs often paw at blinds merely to try and see through them. Vertical blinds offer dogs an easy ability to look outside. While this one seems like an odd choice (cellular shades are fragile, after all!) they can be a great option for certain dogs. This is because cellular shades cover up the entire window, and don’t offer them any ability whatsoever to see through them. Thus certain dogs don’t even see them as obstacles in the first place. In San Diego, shades can also be a great option for keeping the hot sun from your home and lowering your energy costs. Modern roller shades are often very smooth and roll up slowly and easily. If your dog really needs to see what’s going on outside, he or she can lift them up with their snout with ease. These are also great for dogs who merely want a glimpse outside. In San Diego, shutters of the plantation variety are commonplace, and offer dogs different openings and slats that they can look through relatively easily. San Diego wood blinds that are wide slat give dogs a lot of space to be able to see what’s going on outside. However, you should be sure you have a well-behaved dog for these window coverings, as they have a tendency to snap under enough pressure. If this happens, new slats can be ordered and installed. Aluminum Mini Blinds – They bend very easily. Small Slat Blinds – These offer very little space for dogs to see through and they’ll likely paw at and break them. Corded Blinds – Dogs and cats can get tangled up in these long cords. In extreme circumstances this can lead to them accidentally hanging themselves. Puddled Drapes – These often hang down onto the floor and collect animal hair very easily. Wood blinds with cloth tapes – Fabric tapes collect plenty of animal hair. If you have dogs and cats, it’s always better to use wood San Diego blinds, shades, and shutters.